It’s time for a fairy tales theme so bring on all the princess, princes, castles, jewels, bears, billy goats, giants, golden eggs, and dragons! There are endless fairy tale books you can use which means endless learning activities you can plan. 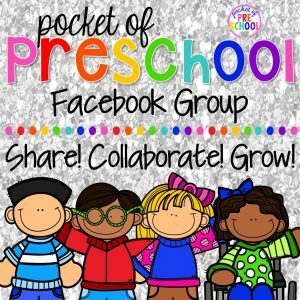 I’m here to share my favorite, go to fairy tales activities my preschool and pre-k students want to play again and again. Make sure you grab the shape crown craft FREEBIE next in this post. Shape Crown FREEBIE! The first thing you think of when someone says fairy tales is what? A princess and prince right! Print the page on yellow paper and set out a tray of paper or foam shapes. I also put out these fancy rhinestone stickers I had (Walmart find) to make the crowns extra sparkly. It’s a fun craft to learn about shapes and strengthen those scissor skills. Princess and the Pea Patterns! Cut up pipe cleaners and make giant patterns. Pretend the pipe cleaners are mattresses for the princess and the pea. Rapunzel Measure! Make braids using various colored yarn. I don’t know why but the brown yarn in my photo below looks black so know I did include beautiful brown braids! Use colored cubes or any math manipulative to measure the braids and compare the length (non-standard measurement oh yeah). Beanstalk Number Match! Jack and the Beanstalk is a favorite every year so make it into a math game. Students can count and match quantities and numbers that are represented in different ways. I added green gems and gold magic beans (not pictured) for added fun. To make gold magic beans simply paint lima beans with gold acrylic paint. Fairy Tales Blocks and STEM Ideas! Take the fairy tales theme to the blocks center with my Fairy Tales STEM I Can Build. Add gold cups to build castles with (Party City), moss rocks (Dollar Tree), unicorns or ponies (Dollar Tree), dragons and knights (Toobs figures from Michaels), colored felt, cut up necklaces, tree logs (Discount School Supply), and mini crowns (party crowns I cut in half from Target), and fake leaves (Dollar Tree). You will be amazed at how excited and engaged your little builders will be with fancy new props for your fairy tale theme. Look at what this group of ladies built with all of the fairy props….. a magnificent castle! Fairy Tale Sensory Bin! Put dried peas, shape gems (Michaels), metallic eggs, mini unicorns or fairies, moss rocks (Dollar Tree), and tweezers in your sensory bin for a fun fairy tale themed sensory bin. My students sorted the gems into matching colored eggs (math), sorted the gems by shape (more math), hid the unicorns in the eggs, or just filled the eggs up with tiny treasures. Anyway, they play they are strengthening those fine motor muscles as they pinch, pick up, or open and close the eggs! Fairy Tale Play Dough Tray! If you read any of my themed center posts you will likely find a themed play dough tray to match because my kids LOVE play dough trays. They get played with almost EVERY DAY during free choice centers! This fairy tale play dough tray has green gems (Dollar Tree), small pebbles (Dollar Tree), ponies (Dollar Tree), shape gems, cut up plastic necklaces, dragons (Toob), fairy tale cookie cutters, and play dough. Students can sculpt, poke, hide, and smash the play dough as they wish all while working those fine motor muscles and problem solving along the way! Jack and the Beanstalk Letter Match! I took a big egg crate (from Sams for free), placed dot stickers in each, and wrapped a green vine (aka beanstalk) around it. Oh and I wrote a letter on each dot sticker. Then I wrote letters on some magic gold beans, uppercase letter on one side and lowercase letter on the other side. I cut white paper clouds to put under it to make it look like the castle in the sky. This would be fun to make into a counting game by placing number stickers in each and students count out the corresponding number of magic beans! To make magic gold beans, just grab some lima beans, place in a baggie with gold acrylic paint, and shake. Then lay out to dry. Crown Letter Match! Learning letters is HARD so make it fun with this crown jewel letter match. Students simple match the uppercase and lowercase letters and place them on the crown. This game can also be used to practice sight words and student names. Red Riding Hood Letter Hop! Get students up and moving with this fun letter hop. I found his picnic basket looking paper plates at the Dollar Tree and wrote a letter on each one. Students take turns hoping through Red Riding Hood’s letter path and as they hop over the letter they say it. Give students a small basket to make it even more like the fairy tale! It’s also an easy way to observe and assess jumping. Fairy Tale Writing Center! Place fairy tale word cards, fairy tale paper, and various writing supplies at the table. I added these DIY chalkboards I made using trays from the Dollar Tree for new way to explore writing. Magic Wand Word Work! Building words can get boring but spice it up using magic wands. Take some sparkly pipe cleaners and bend the end into a star to create a magic wand. Students lace the uppercase or lowercase letter beads onto the wand to build the word. Fun right! Cinderella’s Sound Match (or letter)! Cinderella needs help matching her glass slippers. Use a hole punch so students can link the pairs up together with a chain manipulative. Again, sneaking in more fine motor and eye-hand coordination work. If you have younger students who are not ready to match beginning sounds, this game also comes with uppercase and lowercase letters to match up. Three Pigs Letter Formation Cards! Make handwriting and learning how to make letters hands on with these letter formation cards. Build letters just like the three little pigs with straw (yellow pipe cleaners), sticks (small popsicle sticks), and bricks (red gems or red brick blocks). Fairy Tale Books! Oh my goodness. There are so many amazing fairy tale books my shelf just isn’t big enough. My new favorites are the board books across the top which are part of the Once Upon a World series. Please remember to have fairy books that look like all your students in your classroom. They will be so excited when they see princesses and princes that look like them. Three Pigs Art! Put the paintbrushes away and paint like the three little pigs. Paint with straw (twine), sticks (popsicle sticks), and a brick (red block). I love using these plastic food trays from the Dollar Tree for painting projects. If you want to do the activity again the next day, just cover the tray (brushes and all) with plastic wrap. Fairy Tale Theater Dramatic Play! Transform the dramatic play center into a Fairy Tale Theater for your fairy theme. Students can retell and act out various fairy tales during play. Students will be building reading comprehension, sense of story, book skills, and fluency each time they act out the book or watch from the audience. Add a concession stand to the theater and you can sneak in tons of math opportunities like counting money, identifying numbers when they read the snack prices, weighing candy, and sorting the candy by color. Want all the Fairy Tales Theater printables? Grab my Fairy Tales Theater Dramatic Play HERE. Whoo! 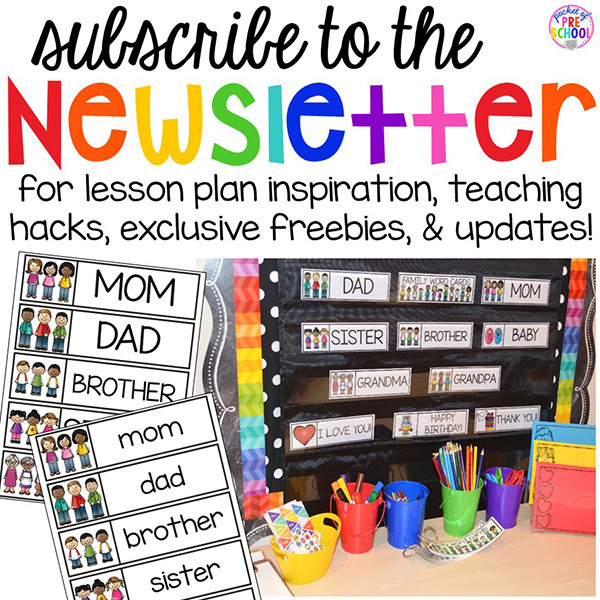 You got to the end and I’m sure you can pack your lesson plans full with fun fairy tale themed activities your kiddos can learn a ton from. Now if you want to grab my fairy tales printables (so you don’t have to make them yourself) here are all the links you will need! Love these fairy tale activities? Pin this image!